Thank you for the notes and comments. To my great relief, today was, cold? What cold? 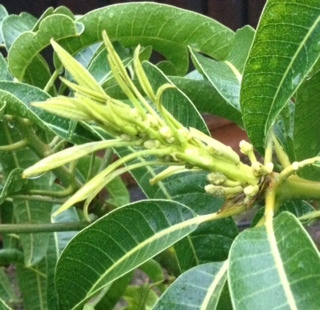 New mango leaves and inflorescence–today they have stalks. This is new. Meantime, I’ve been riveted by updates on Christine Blasey Ford’s case. There is no statute of limitations for felony sexual assault in Maryland. Montgomery County’s chief of police just tweeted that all he needs is for her to file a criminal complaint and he’s prepared to investigate. That would mean that Kavanaugh and his friend Mark Judge could be put under oath by the county, at a time when the Republicans on the Judiciary Committee are doing everything they can to stave that off and rush a vote before any truth squeezes out. 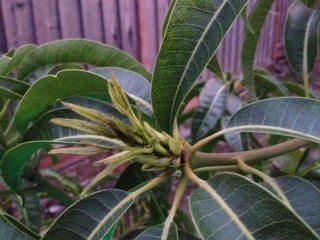 Well that was fast: the edges of new flower buds popped out from among the tiny baby leaves today. Note that one of the sources of warmth was directly below. If I think about the dozen cowls and three afghans in my mental queue it can be a bit overwhelming. Better to take it one project at a time. So having a finished one helps a lot. 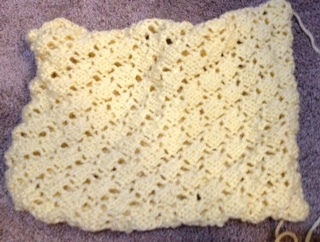 Photo’d, then rinsed, now blocking. 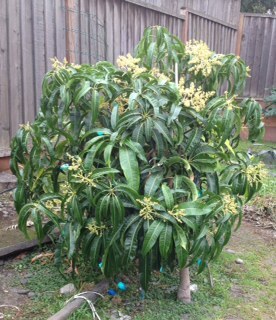 It was 44F this morning, which is why the mango tree has been back to being lit up and covered over at night of late. Right now it’s 49 vs. 68 under there. 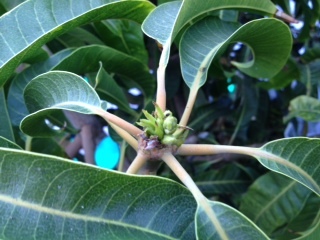 Its response to the artificially warmer nights is that those fruits are growing fast enough to see the difference in a day or two–and some branches started doing a new growth flush today. 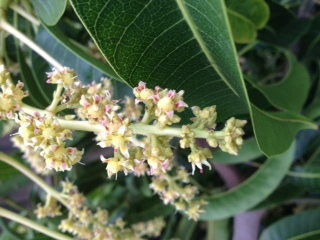 Which means we could end up with holiday-season blossoms to feed the bees and start up the next batch. Hanging down now from the weight of the fruit: this is good. 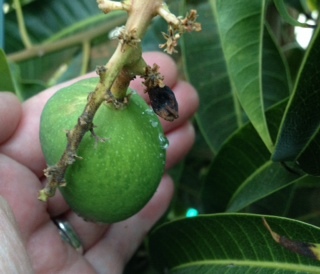 The forecast said 53F for last night, reality was 49F at 7:30 this morning; there was a black ring now around the stem of a mango at the top of the tree, a sign of cold damage; I expect we’ll lose that one. So tonight the tree got the first frost covers of the season to go with the warming lights. Excuse me, is there an ant in my hair? 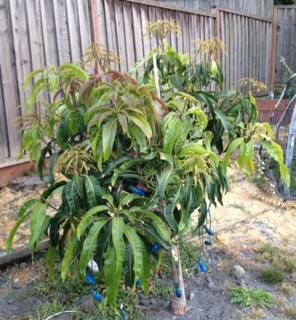 The mango tree is taking another try at production, July being warmer and more inviting than November was. The first spray of blooms is fading out and eight tiny green fruits have taken hold there, while new clusters are popping open behind. One problem was ants chomping on the flowers, with the cinnamon being less of a deterrent than it seemed to have been in the past. And I don’t want to chase away bees. So I tried something else: I cut a strip of paper, put it around the tree, and twisted some packaging tape over it twice around so that the insects’ feet would get stuck in the tape. Only they don’t: I watched them while watering the other trees, and they turned around from it before they even got up to it. I’m good with that. 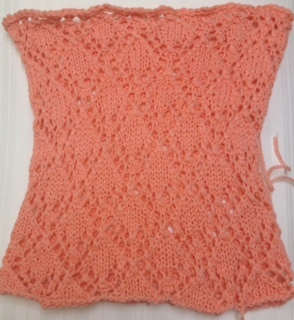 Another Piuma peach cashmere cowl, and I just cast on yet another. Except what I really want to knit right now, for no particularly good reason in the heat of the summer, is a thick warm hat. Maybe for variety’s sake? We’ll see. 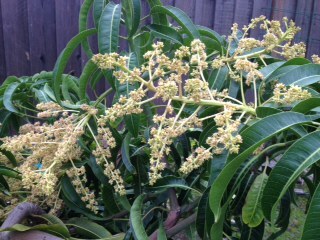 The mango tree is loving the warmth, meantime (and me the air conditioning.) 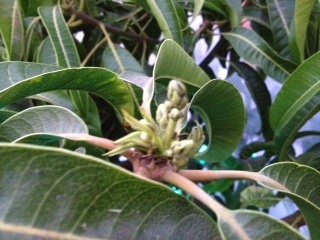 There are five smaller sprays of buds coming along quietly further back that will soon be as big as this one. 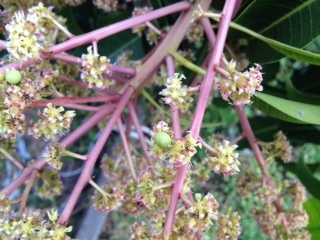 The earliest blossoms, the earliest fruit set. Got told something I thought I’d pass along: to keep raccoons out of your tomatoes and fruit, the most effective thing is chicken wire–it’s flimsy enough under their weight to scare them and they won’t climb it. 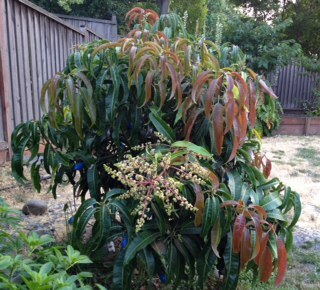 Since I’m told Alphonso mangos take about six months to grow and ripen in June, seems to me our four-year-old tree has finally grown enough to be settled in on schedule. I had wondered whether the beehive across the fence would take a winter break, but look at that center picture–clearly things are working. This time it’s old enough to hold onto those beginning fruits, if we can just keep it consistently warm. We lost last year’s small crop by traveling in April and leaving it uncovered at night, but now I’ve got Eli to help and clearly he did a great job while we were away in November and December. There are more flower clusters under those leaves. Heavenly perfume or no, the squirrels still smell the latex in the sap and walk in a comical half-circle to go around it beyond its drip line (the line one would draw straight down from the outermost leaves), and always have. Well, so far I’ve only knocked one of these flowering tips off while covering/uncovering the mango tree against the nighttime temps (it hit 33F last night.) The whole thing, with all its buds. It was awful. Which means I’ve been mentally inventing all kinds of ways of keeping the frost covers lifted slightly off the tree. Cut a hula-hoop and impale the halves on pairs of stakes? Twenty-one sets of buds with more likely to come later. And then we can start talking about something like this to keep the squirrels out of the fruit. June bearing, said one site. Six months from flower to fruit, said another, with cooler temperatures triggering bud formation. Well then this makes sense. There are a whole lot of these; this is just the one at the top getting the earliest dose of morning sun and furthest along. Each of those little brussels sprouts-y dots becomes a cluster of flowers (most of them male.) 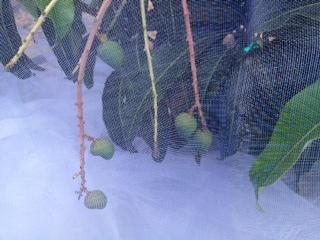 Hoping all goes well, we should get a fair number of mangos this year. One for Danny, who inspired the tree planting, one for Phyllis, who aided and abetted and covered it from time to time for us, one for Eli, for saving it from the cold, too…. We had eleven days in October that were in the 80s or above. This is not normal. 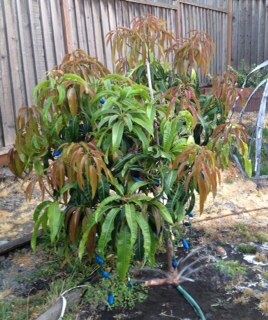 And this is the result: a flush of new mango growth that has to adapt to the now-colder nights while I do my best to keep it warm (with fervent thanks for the help last week while we were out of town.) We might have blossoms at Christmastime and fruit in June or so if we can succeed this year. I do think that one blackened new leaf is a goner. He’s about 13. He cat-sits, including for a friend’s elderly cat that needed its meds while its owner had to go out of town and who was very grateful to him for the help. Just a really great kid. And so it finally occurred to me that I could ask if he would mango-tree-sit, too, keeping it covered by night and uncovered by day. So I sent an email to his mom. This is (editorial note: let’s change it to Jacob). I’d love to take care of your tree. I could stop by with my mom tomorrow between 4 and 5 so you can show me what to do. Will that work? You can pay me $5 for both days. If it has any favorite books to be read at night, let me know. Meantime, I guffawed at that note and then read it out loud for my wondering sweetie, who guffawed in turn and promptly found and ordered this: a children’s book about a tree in the forest decorated with things for the wildlife to share. The perfect story. Maybe it’ll even come in time. Go Jacob! Another “this, now this” pair of pictures. July 4th to July 12th. 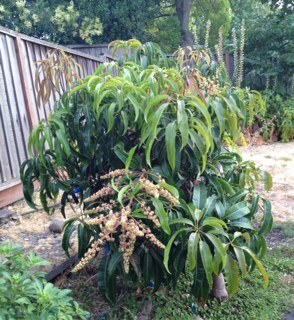 The Alphonso mango tree is loving the summer sun and heat. But it suddenly hit me today that by this time the last two years I’d carefully unwound the Christmas lights so that there would be no chance of the tree growing into the cord or becoming inextricably tangled. Um. I think I need to wait until the new growths are hardened off a bit before I dare mess with them, and as long as they’re red they’re not done growing–and there are a whole bunch more just now popping out into view. Maybe this year I just leave the lights be? But I so love how the tree is filling out. Y’know, sloshing the brain around in four falls in four days is just not a great idea. I’m putting me on timeout. The thicker the trunk grows, the hardier it becomes against future cold.